Chili Supper with Council of Churches – All proceeds to the Culver Food Pantry – Lions, Council Members and CYCO working together. Business Professionals of America– Donated $400 to assist this Culver High School organization in their travels to participate in National Competition. Sponsorship for Culver Girls soccer ($110) and Culver Boys Soccer ($110). Liberty Day at Culver Community Schools– Thanks to Lion Barb Winters for arranging this event. Each student received a copy of the United States Constitution booklet that is prepared by the Indiana Lions. “Paws for Life” Lions Team – Relay for Life Cancer Walk — … Thanks to Lions Kathy Berindei (Team Captain), Dan Adams, Rich Bean, and Marlene Mahler (our 4 AM pancake makers). Thanks to all the Lions who walked – Way to go Team! Lion Cathy Emmons in the Walk. 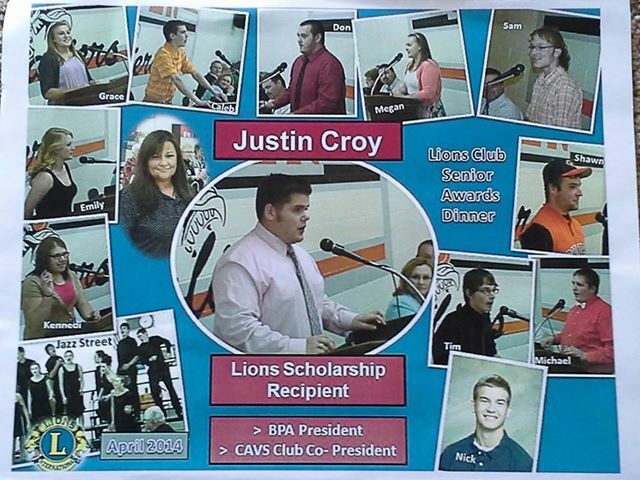 Community HS Senior Awards and Scholarship – A Lion scholarship of $1,000 was presented to Justin Croy. Thank You to the Back Room Committee – Thanks to Lions Trent Bennett, Dan Adams, Mike Overmyer, Jim Hahn, Warren Foersch. They have turned the “Back Room Abyss” into a shining jewel. Committee: Thanks for the work and the donations! Lions Spring Fest Flea Market…Bake Sale….Breakfast …. Thanks to Lion Chair Persons Rich Bean, Dan Adams and Marilyn Kelly and ALL of those Lion WORKERS!! 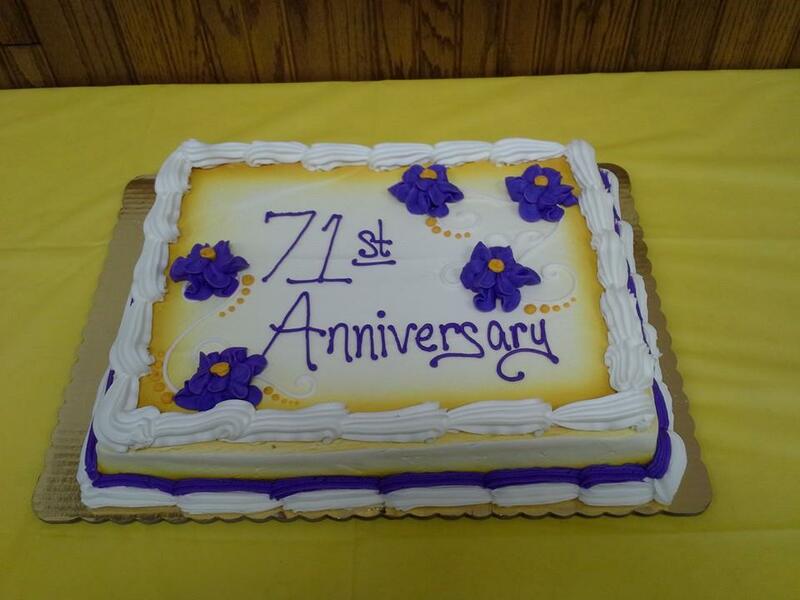 The Culver Lions 71st Anniversary (1943-2014). Thanks to the Committee that made all of the arrangements for a full house attendance. 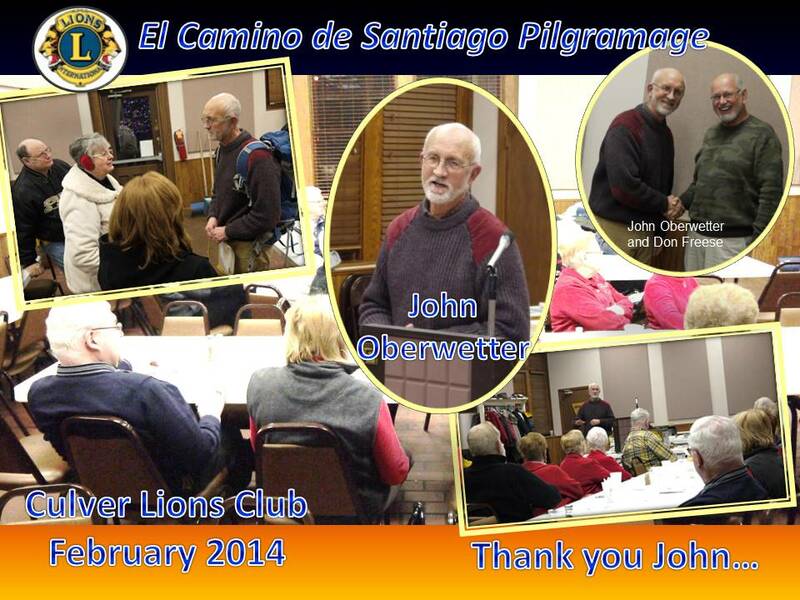 Special thanks to Lions: Marilyn Kelly, Susan Elizondo, Lynn Davis and Jill Neidlinger. It was a fun event and a good send-off for additional service now and into the future. Several Awards of recognition were presented that night. Car Wash Fundraiser: Landrum Neer and James Jamison organized a Car Wash as a Fundraising Project to benefit the Culver Lion’s Club. The young gentlemen did a very nice job and were very successful. Our very own, Lion Justin Croy, won the International Junior Auctioneering Championship in Louisville. Take a look at his impressive auctioneering skills. 2014 Corn Roast: Another successful year!!! White Cane Day – a wonderful job by all who volunteered and a BIG THANKS!!! to all who donated and support the Culver Lions, we really appreciate you! Lake Max Triathlon – what a great turn-out!!! People came from all over to participate and seemed to really enjoy themselves!! New Members – WELCOME to Cheryl Geik and Michele Trusty & thanks to their sponsors, Barbara Winters & Jill Neidlinger. New Member – Welcome to Bridget Lowry (sponsor – Barbara Winters) . Dictionary Project – Thanks to the Lion’s who went to the Culver Elementary School to distribute dictionaries to all of the 3rd graders. The kids (and Lion’s Club members) had a great time learning about how many things dictionaries can teach us. Lions Fall Fest Flea Market…Bake Sale….Breakfast …. Thanks to Lion Chair Persons Don Burke, Dan Adams and Marilyn Kelly and ALL of those Lion WORKERS!! Children’s Halloween Party – over 200 children turned out for the annual Halloween Party! Great fun was had by all!!! Thanks to the wonderful volunteers and donors, especially the judges who had the ever-challenging task of picking the best costumes! However, everyone went home winners, with lots of prizes and goodies!! Fruit Sales – our annual fruit sale kicked off so our friends could enjoy the citrus in time for Thanksgiving! Children’s Christmas Party – the Culver Fire Department and V.F.W., along with the Lion’s, hosted the annual Christmas Party for the children of the community at the Culver Elementary Cafeteria. There were activities, treats, and a visit from Santa Claus!! $ 250 To: Indiana State Lions Building Restoration in Indianapolis. 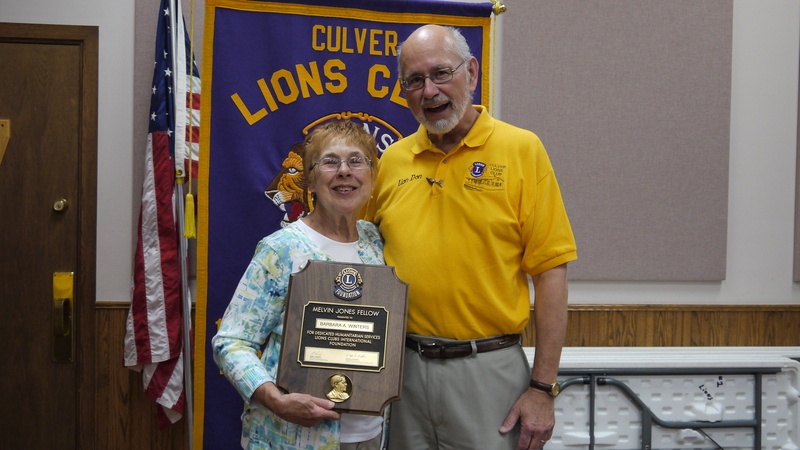 Lion Clara will be missed in the Culver area and in the Culver Lions in particular. She was a regular attendee at the Lion’s meetings. She was very instrumental in the annual Culver Lions Raffle and the selection of a suitable “Judge” for our annual “Get Out of Jail” fund raiser. 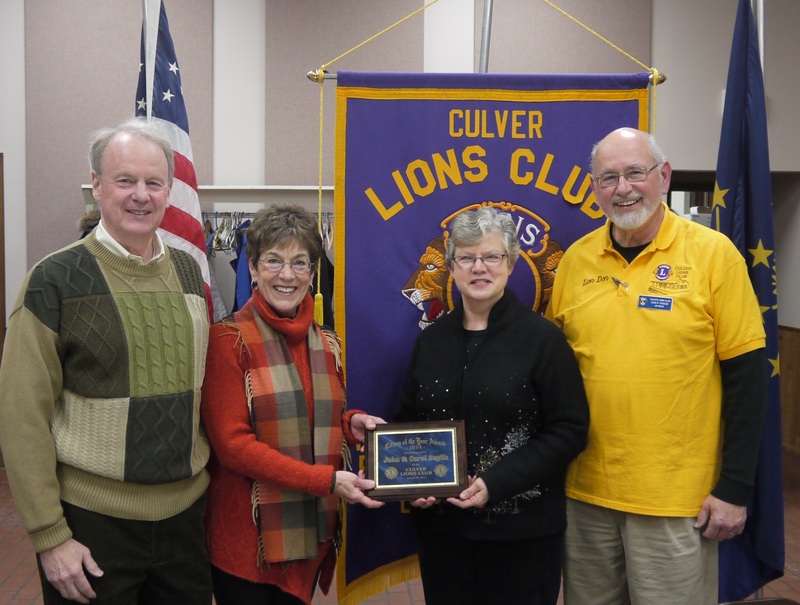 She was the first woman to join the Culver Lions Club…she was an active Lion volunteer…she was fun, always optimistic and a “doer”. Clara…you are now at peace and at rest….We thank you for your service and dedication…… From: Your Fellow Lion Brothers and Sisters. 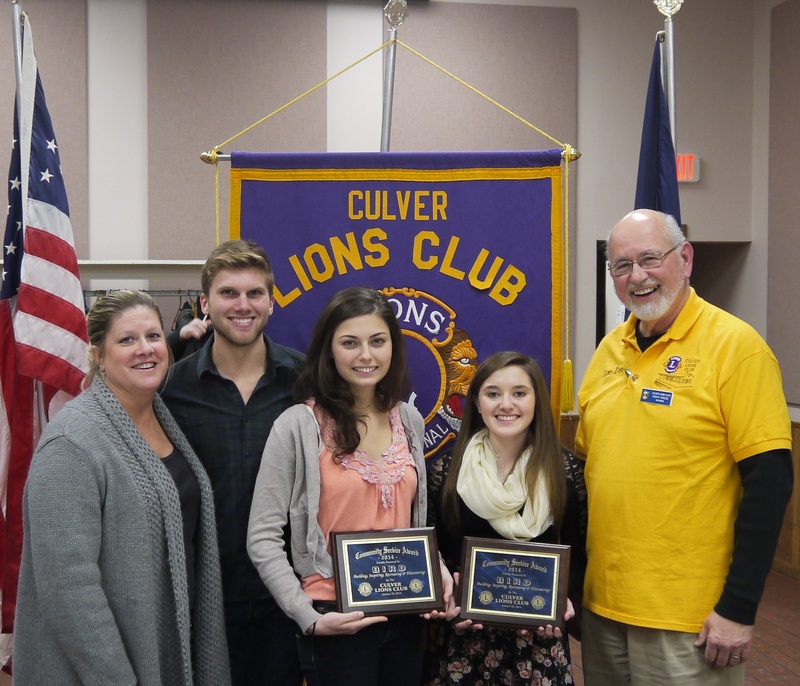 The Culver Lions managed and/or participated in 5 major events from July 9th to August 9th, 2014. Thanks to all who did the planning, organizing and volunteering for all of those shifts! Thanksgiving is a word that once a year is often heard. give thanks for food and your new ball. just that towards gratitude you’re leaning. that’s corn and bread and stuff. 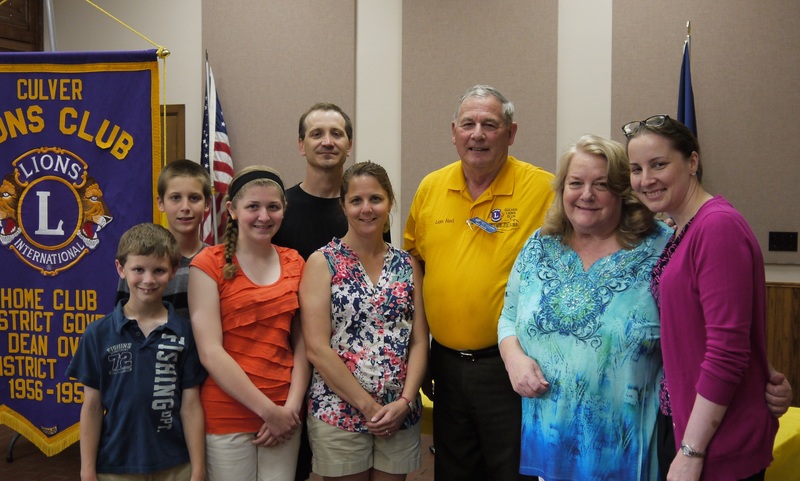 on to Thanksgiving – make it snappy.
. . . let’s not forget our Lions Club! !